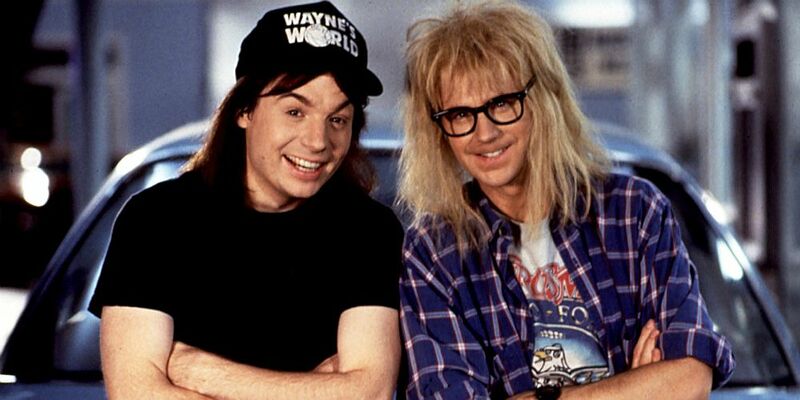 It’s not often that a Saturday Night Live sketch makes a great movie, but Mike Myers and Dana Carvey’s Wayne’s World was such a huge hit that it got a sequel. The original sketch idea was rejected by most of the SNL writers, because they thought the target was too obscure, but you only have to look at the monstrous success and cult following of those movies to see that they were totally wrong. These are two of the most quotable movies ever made. So, if you think you’re worthy, here are the ten funniest quotes. 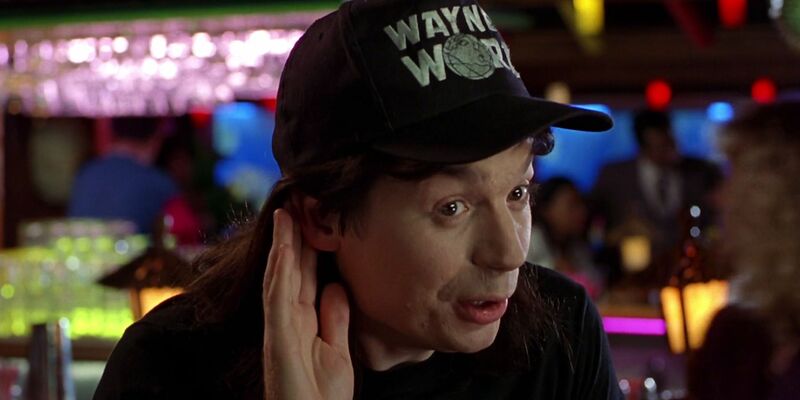 Wayne’s World 2 needed to be completely rewritten after Mike Myers failed to tell the studio that the original version was a soft remake of an old British movie and they were furious. Considering the sequel had to be written in such sharpish fashion, there are a number of inspired, well-crafted subplots in it. One of them is Garth’s romance with Kim Basinger’s character, Honey Hornée. For whatever reason, she is enamored with him and will do anything to be with him, eventually asking him to murder her husband for her. 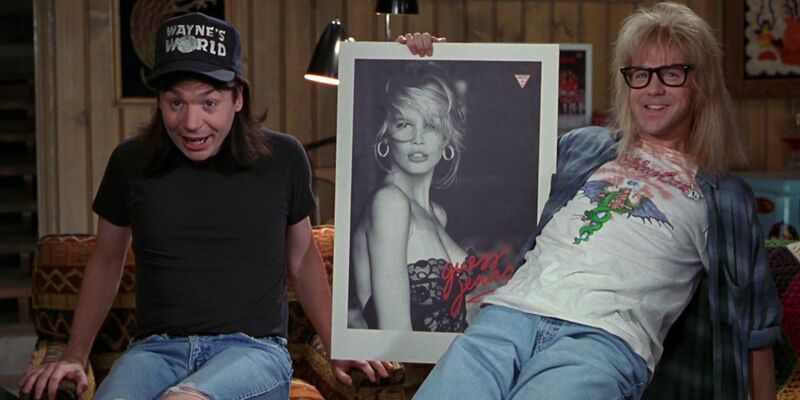 Wayne’s World was doing meta, self-aware humor before it was cool. 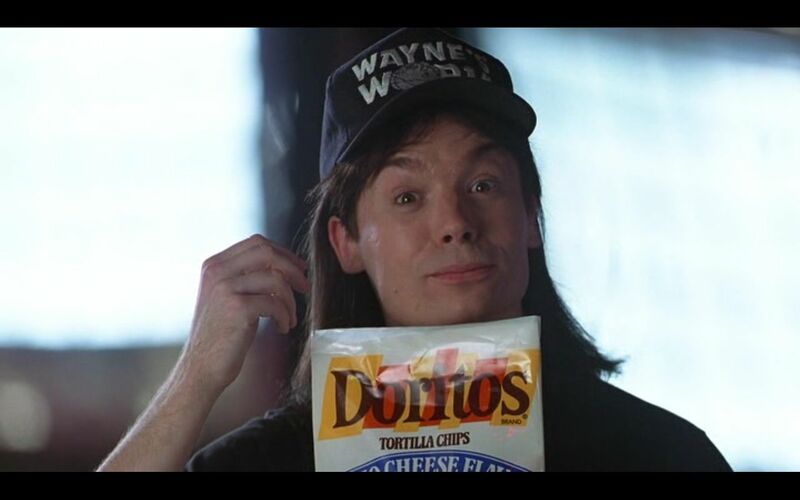 Now, all comedy is doing it, but Wayne’s World started the craze. One example is when Wayne is forbidden from playing Led Zeppelin’s epic hit “Stairway to Heaven,” because the licensing and royalty fees for the biggest rock band’s biggest song would be too expensive. Wayne and Garth’s partnership was made so iconic by the SNL sketches and the movies that they inspired a video game and a roller coaster. So, the producers probably could’ve afforded “Stairway to Heaven.” But this is meta humor at its best. Most movies want you to enter their reality and follow their characters through their world without acknowledging that it’s just a movie that people are watching to pass the time. 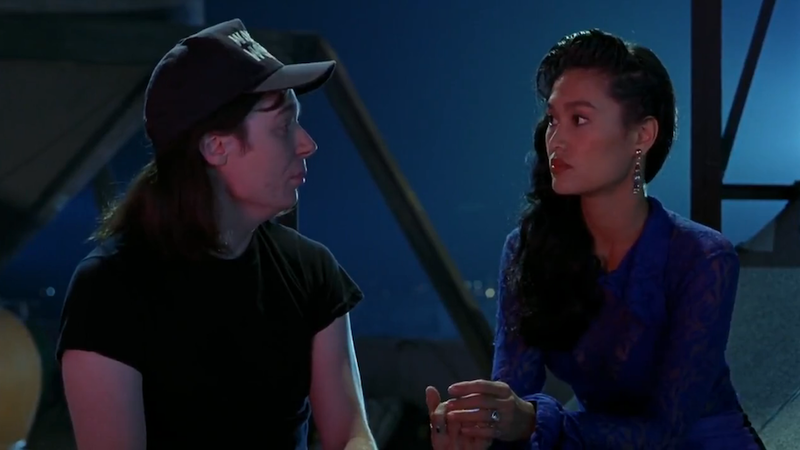 But Wayne’s World is more postmodern and self-aware than that. Wayne breaks the fourth wall more than Deadpool, and he suggests a bunch of alternative endings for the movie he’s actually in. The options are: “the sad ending,” where nothing works out for anyone except Rob Lowe’s villain; “the mega-happy ending,” where things work out unrealistically well for Wayne and Garth; and “the Scooby-Doo ending,” where it turns into a mystery story. The latter is certainly interesting. 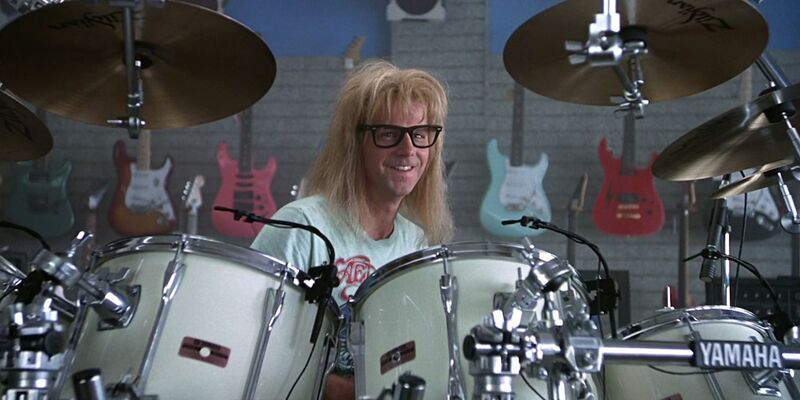 The first Wayne’s World movie was such a huge hit that the sequel was able to bag cameos from such huge stars as Aerosmith, Rip Taylor, Heather Locklear, Jay Leno, and even Charlton Heston. Drew Barrymore also makes an appearance as “Bjergen Kjergen from the Fjergen Fjords,” Handsome Dan’s Swedish receptionist. Handsome Dan, of course, turns out to be not so handsome after all, since he’s played by a greasy-haired Harry Shearer, who plays him with an attractive-sounding voice. The media’s shameless use of product placement in the past half a century or so since the dawn of television has presented opportunities to advertise products through entertainment. During this whole monologue against corporate sponsorship, Wayne is eating from a pizza box with the Pizza Hut logo on it and Garth is wearing clothes covered in the Reebok logo. The joke doesn’t really land when it’s written down – Myers’ comic delivery, and the way he blends the words together by saying them really quickly, is what makes it work – but thanks to the movie being a classic, reading it triggers that memory. Wayne and Garth were created in the first place to spoof rock ‘n’ roll fandom, which is what makes this one of the most relatable quotes in the franchise. Rock fans go to so many concerts that they’re bound to bump into rock stars backstage or at the bar. 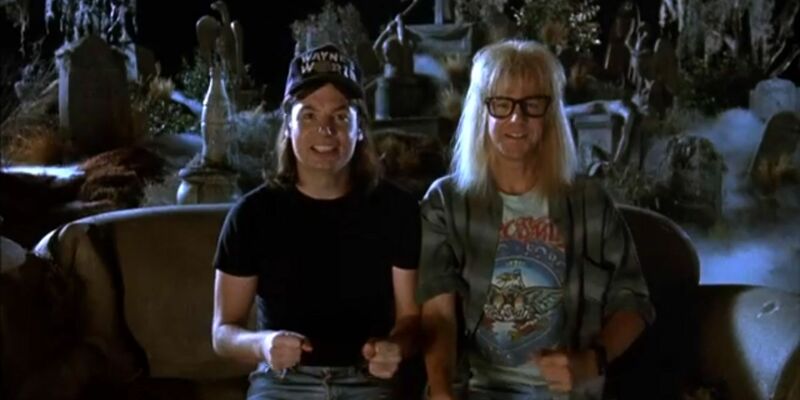 When Wayne and Garth find themselves in this situation, either with Alice Cooper or Aerosmith, they get down on their knees and yell out, “We’re not worthy! 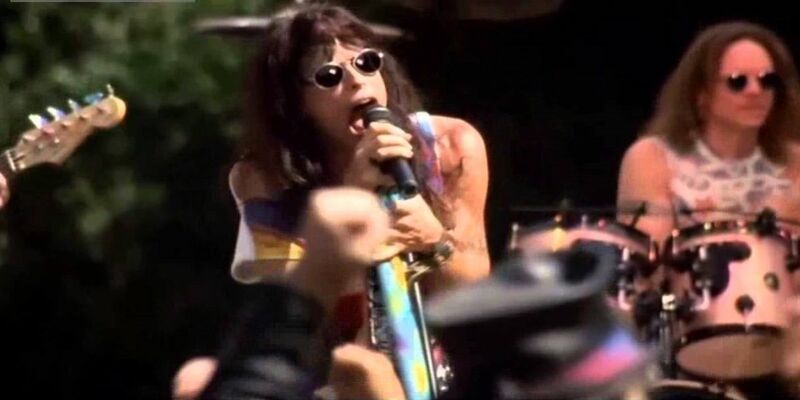 We’re not worthy!” There was a rumor that Mike Myers tried to get Nirvana to appear in the big Waynestock sequence at the end of Wayne’s World 2, but Kurt Cobain canned the appearance after being unimpressed with the movie’s absurdist humor. Like the use of the term “clunge” in The Inbetweeners, “Schwing!” is a chance for the Wayne’s World movies to make dirty jokes without being overtly on-the-nose with the dirtiness. Everyone knows what Wayne or Garth mean when they say, “Schwing!” and thrust their hips in the direction of a nearby attractive woman, but it doesn’t need to be said out loud, because that made-up word and the way the guys say it says it all. Director Penelope Spheeris was chosen for the first Wayne’s World movie based on her experiences helming documentaries about the rock music scene – she knew metalheads better than anyone. This quote is taken for granted, because it’s the line that Wayne and Garth use to open every single episode of their public access rock ‘n’ roll talk show. But it’s simply the most memorable line in the Wayne’s World movies. It’s the first line that comes to mind when people think about those characters and that’s because it has a timeless, lasting quality. Everyone enjoys excellence and parties, so this is an applicable quote in real life. They also make a weird “Woo-ooo-ooo-ooo!” sound at the end of their intro that everyone remembers.